I love beans, and I really love black beans. I love them in burgers, and I love this vegetarian black bean soup! Unfortunately, my family doesn’t share my love of the bean, so I don’t get to make this very often. But when I do, lookout! This recipe comes out, and the soup making begins. Beans are easy to grow in the garden. They require little once they are started, other than weeding and watering, which makes them a great garden addition. They are full of protein and fiber with little to no fat, which makes them a perfect addition to your diet. There’s no much this amazing little bean can’t do! Try this soup and see what I mean! Black beans are also easy to store. You can easily store them dried, or canned. If you are storing them canned, you simply need to open the jar, heat and eat! That makes for quick and easy meals, right? To see how to can your own black beans, watch the video here. 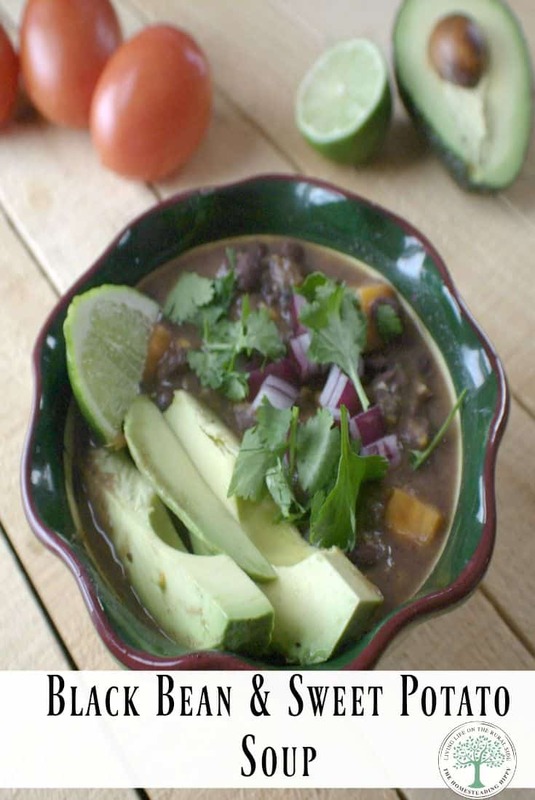 This healthy black bean soup is perfect any time of year. It’s warming in the winter, and light in the summer. Adding the sweet potatoes gives it the body and a slight sweetness. 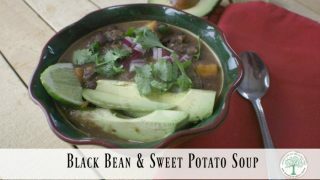 One of the best parts of this simple black bean soup recipe is that you can easily double or triple it, and freeze it into meal sized portions. Rich and creamy, this black bean soup is a fiber packed way to warm up during the cooler fall weather. If using dried beans, soak over night, rinse and fill pot with clean water. Simmer on low for 6 hours, or until cooked through. Roast the sweet potatoes in a 450° oven for 20 minutes. Allow to cool, then remove skins. Drain beans, add the sweet potatoes, seasonings and broth. Using a stick blender, or hand blender, blend until smooth. Squeeze lime juice over the soup. Peel the sweet potatoes and cut into 1 inch cubes. Add potatoes and beans to crockpot. Add remaining seasonings and adjust as necessary. Have you tried black bean soup yet? Be sure to pin this for later! Thank you so much! With a few rough months in commissions, I have been working my way through our pantry supply. I just so happen to have black beans & sweet potatoes – and I would never have thought to put them together in a soup! We even have a bag of tortilla chips! No cheese, but maybe a dollop of sour cream would work?! I’m glad I can help! It’s a great soup, filling and cheap! Enjoy! Beans! Beans! The Magical Fruit! Let’s have beans with every meal! Oh thanks for this, I’m going to soak beans tonight and make this tomorrow! Lime juice! Sounds great! I’ve never tried sweet potatoes with beans. it’s aaaahmazing! Let me know how you like it.